sorta like the Turnout vs Switch terminology. I can not get my dual ampac 780 to work properly as advertised. I'm at a loss on how to get my new MRC dual 780 XFMR to work. to work with dual controls. the two power packs together to go to the 'common rail'. would be input for your block control switches. I have 60 ft long O scale layout with 3 layers of track on 1 transformer (MRC). The layout is divided into two sections. One part is 12 feet wide and the other about 24 feet wide. Is it possible to add a second transformer in the other section to help the existing transformer? There is a lack of power to some of the track. Lack of power? You mean there is voltage, just not enough? 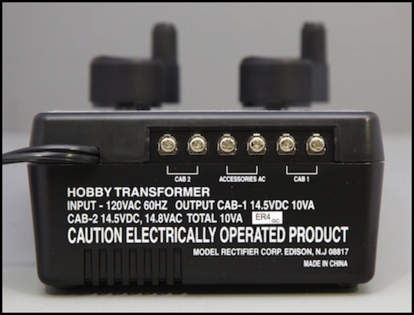 It is not likely your transformer/controller. You need to install a track power connector every 8 feet to keep voltage close to same on all sections of track. Nickel-silver and brass are not near as good a conductor as copper and low voltage makes the percent drop worse. I use #20 gauge power wires from controller to track power terminals. 1. )What technique could I employ in repairing the dc outputs. 3. )The XFMR is in a copper color metal case. 3.) Copper-colored metal cases are common on most MRC power packs. 2.) Yes, it is fixable. You just need to replace the broken terminal strip. 1.) I'd use a screw terminal strip, also called a "barrier strip"as a replacement for the damaged terminals. These strips are made of black Bakelite and have rectangular silver plates with two screws in each plate, The plates are divided by raised Bakelite walls or barriers to keep adjacent wires from shorting to each other. They are sold by electronic parts dealers like www.allelectronics.com Scroll down the left side to "terminal strips. Look at Cat.# TS-204 & TS-206. With the power pack unplugged from the wall outlet, simply attach each of the DC output wires from your damaged strip to one of the terminal screws on the new strip. Then wires from the track can be attached to the second screw on each terminal. The strips have holes at each end for mounting them. Mark, center punch, and drill a hole for a screw at each end of the new strip. Be very careful not to drill one little bit further than you have to beyond the metal case. You don't want to drill into any electronics inside your power pack! Also do not use flat-head countersink-shaped wood/sheet metal screws to fasten the terminal strip to the case. Instead use round head, or pan head screws, & a small washer. Bakelite is very brittle. Driving a counter sink screw head into it will split the terminal strip at the mounting hole. Also don't screw in too tightly, also to prevent damage to the strip. Last edited by traction fan; 04-13-2019 at 06:56 PM..
What you likely have (no picture) is a flat phenolic terminal strip. Here is a 12 position terminal strip listed on ebay. You can cut it to the length & amount of terminals you need. Here is the picture of your power controller terminals.